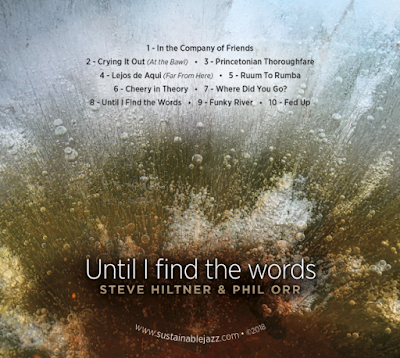 Sustainable Jazz Ensemble: Sustainable Jazz CD Available: "Until I Find the Words"
After years of playing, composing, and cogitating, Sustainable Jazz has given birth to a recording, and it's a sweetheart. Each tune has its own special feel, from ballad to bounce, tango to swing. These are the tunes Phil and I have been performing at parties and concerts, recorded in a studio with a gorgeous piano sound. Photographs are of my own taking, with bubbles trapped in ice on the cover, and the liquid mysteries of a vernal pool on the inside. The music is available for digital download. Check out the snippets of each tune. A Sustainable Jazz Interview on TV!